Sesame Technologies Pvt. Ltd. is a wholly owned subsidiary company of Sesame Software Solutions Pvt. Ltd., Which is a Nasscom Member & BVQI ISO 9001:2008 certified, 19 year old market leader, providing IT solutions and services to an array of enterprises globally. Sesame Web & Multimedia division which was a part of the parent company for more than a decade, spun off and established itself as a separate entity in January 2013. Sesame Technologies (shortly called as ST), with a capital base of sharp skills, lucid vision and strong values is all set to be a forerunner in IT industry. In Analytics solution area we provide decision making information by analyzing historical data as well as real time data . Our analytical engines will capture data from any existing applications like ERP, POS, CRM or any such software applications with back end data base and will help the top management team to find the patterns which will throw out decision making information. We can set up Dash boards with status of required KPIs based on customer requirements. We develop very attractive corporate websites, portals, web based applications, News letter sending engines and also providing Search engine Optimization works. We can develop websites in latest technology which will help customers to view the website without any distortions in whatever gadgets they use. Our expert creative team can deliver excellent graphical and multimedia solutions for customers. Our expertise are in the areas like branding concepts, 2d animations, web videos etc. Our expertise in this area is to set up any kind of ODCs with team having niche skill sets as required by the customers. Companies who don’t want to take the headache of recruiting and maintaining IT team can just assign the job to us and relax. 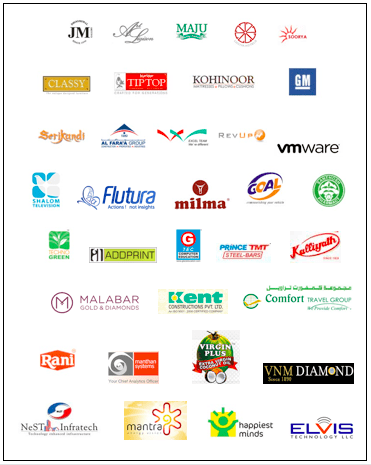 400 + customers from various verticals and across the Globe has already trusted us and started their journey with us by depending on various solutions provided by our master brains. A dynamic team with dedicated and highly skilled professionals and a set of well defined processes help us to do quality work in a cost effective manner ensuring our each customer a fast turn around and high profits for whatever they invests for our solutions. Analytics for a Better Life!